Diamonds: All Sizes Wanted, Top Cash Paid!!! Bring in All Items or We’ll Come to you! FREE Evaluation! David Ellis Cherry Creek Welcomes You! Welcomes You! 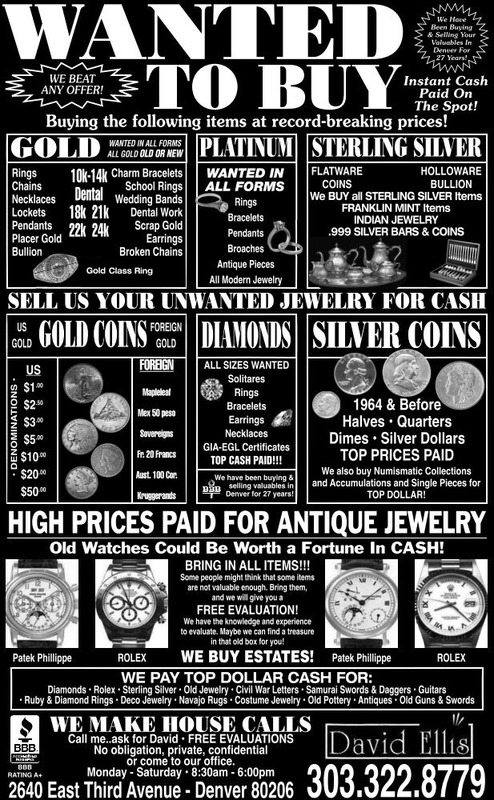 We Buy & Sell Gold, Silver and Antiques! Is your Grandpa’s old watch lying in your closet, gathering dust? Maybe, you have not realized that old watches could be worth a fortune in cash! Bring it to David Ellis Cherry Creek today and get it evaluated to learn about it’s true worth in dollars. Based in Denver, CO, we are your one-stop destination for all your gold, silver, old watch and jewelry buying or selling needs. When you need quick cash, remember David Ellis Cherry Creek. Our convenient Denver location in Cherry Creek makes it easy for you to stop by anytime to sell your gold, silver, or antique items, or to buy, too! Instant Cash Paid on the Spot! We will evaluate and pay instant cash on the spot and our prices will beat any offer. When you do business with us you can be rest assured that we will keep all of our transactions private and confidential. Sell gold and silver coins, gold jewelry, silver heirloom items, and much more. Have you ever seen those television programs where people bring in jewelry and antique items to be appraised? We are your local appraisal specialists. We can tell you what your items are worth and pay cash! Many people think that old items such as tea sets, guitars, guns and swords are not valuable enough. They could not be more misinformed! Bring your antique, vintage items and costume jewelry in and we will give you a free evaluation! We have the knowledge and experience to evaluate. Maybe we can find a treasure in that old box for you!